The idea stemmed from Jim and Sabin’s love for the product and the memories it brought from their childhoods. “When you love something there’s always a natural inclination to share it with others,” Sabin reminisces. And share they did. The pair dove into the food truck business, pooling their savings and using their connections in Maine to secure top-of-the-line product, the key to the business’s success. And even with little restaurant experience, the trucks began gathering crowds, and then attention from the ABC hit show, Shark Tank. “I think one of the biggest things that Barbara [Corcoran] liked about us was how we jumped into our business head first,” Sabin adds. “We were passionate and committed. We quit our normal day jobs to do something crazy like opening a food truck. She wanted fearless, and that’s what she got. Today, the business is not just its 20 food trucks. Cousins has a few brick and mortar restaurants now and is also selling and shipping fresh Maine lobster through their website. And now, they’ve launched a book detailing their climb to success to help others learn from their mistakes and start making their dreams a reality, too. Foodable: What was the spark that started Cousins Maine Lobster? Why lobster? Jim: Lobster is an iconic food, and if you’re lucky enough to grow up in Maine, it’s a part of everyday life -- it accompanies holidays, celebrations, family and neighborhood gatherings-- we couldn’t imagine life without it. We wanted to not only share this Maine experience with others, but to also make it accessible and affordable to everyone, and we’re doing that in ways no one else has done before. Foodable: What makes Cousins the “tastiest Maine Lobster rolls” in the US? Sabin: It all starts with the lobster meat. Wild-caught, sustainably harvested, premium lobster from Maine. Using all parts of the lobster-- the tail, claw and knuckle-- so people get a variety of tastes and textures in every bite. It continues with the rolls that we ship straight from Maine. Then there’s our classic preparation. Both Maine and Connecticut styles that let the quality of our lobster meat shine through. 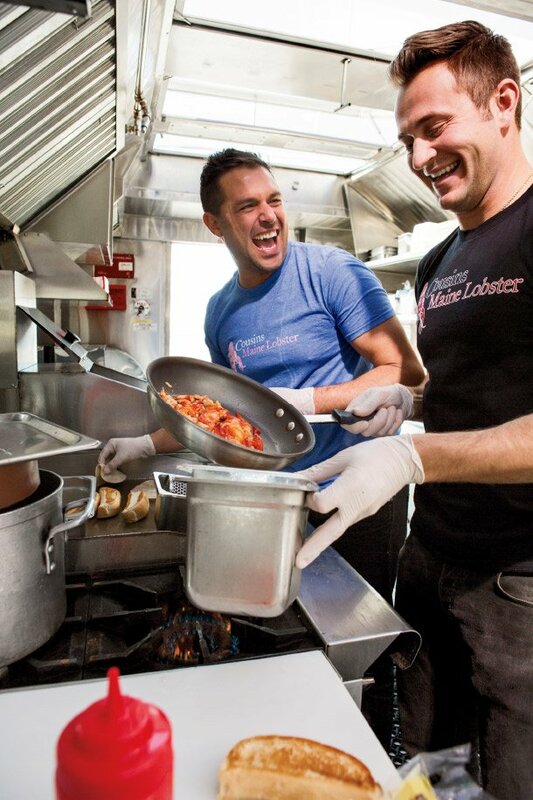 Foodable: Luke’s Lobster has seen huge growth on the East Coast, but has not broken into the California market yet. Do you find your businesses overlapping? How does Cousins differentiate itself? Jim: Not at the moment. There’s some major differences-- we are a franchise, they are corporate-owned. Our model has food trucks and brick & mortar restaurants, there’s is just restaurants. At the moment we occupy different spaces. Foodable: What was the goal when you first started the brand? How has that changed? Sabin: When you start out, you dream big but you focus small. Our initial goal wasn’t to start an international company, it was to create and run a unique food truck whose calling card was its high-quality, authentic product. Jim: It was Barbara who first brought up the idea to franchise. And you know what, we listened to our fans and our customers. Los Angeles is such a melting pot, we got people who visited our truck who told us we needed to open in X city, and Y city. To this day, we get boatloads of emails each and every day from people around the world asking us to bring a taste of Maine to their neighborhood. Foodable: There has been a growth on the sale of fresh seafood online, what do you think has driven that? Sabin: Even just seafood in general. We’re in an age where everyone is looking to diversify their diets, to eat healthier and smarter. Seafood often presents a healthy alternative to red meats. Lobster, for example, is incredibly high in protein. Foodable: What challenges do you have transporting lobster cross country (both for your trucks/restaurants and for your retail business)? Jim: As with any business transporting anything, there’s weather and operational issues that crop up from time to time, but we’ve gotten pretty good at anticipating and dealing with those. The bigger obstacles are really just dealing with a wild-caught product. We have strategic partnerships and proprietary systems in place that help us deliver not only the highest quality product but also the most consistent. Sabin: The state of Maine has put some very thorough sustainability measures in place to protect its lobster population, and those collective efforts have paid huge dividends. The Maine Lobster fishery is a certified environmentally sustainable fishery, meaning that Maine lobster will be the pinnacle of wild-caught premium seafood long into the foreseeable future. Foodable: What do you attribute for your success? Sabin: We never compromise our product. We always, and will always serve the highest quality, wild-caught, sustainably harvested, premium lobster from Maine. We keep it authentic in our preparation, and always use rolls we ship from Maine, because they’re traditional rolls, and they’re what you’d get a small lobster shack along the coast of Maine. We treat our employees and our customers like family because for us, eating lobster was something we do with family and friends. Jim: We also view our success on a sliding scale. You can be successful today, but not tomorrow, as every day presents new challenges and new goals. Our outlook is simply to get better each and every day. We want yesterday’s failures to be today’s successes, and today’s successes to pale in comparison to tomorrow’s. Foodable: What is your new book about and what can aspiring restaurateurs learn from it? Sabin: Our new book is an inside look into how Cousins Maine Lobster came to be, detailing how a multi-million dollar business was grown from just a crazy idea and a single food truck. Jim: We think our story can be a great motivator for the restaurateur or entrepreneur who has a big idea but hasn’t quite mustered up the courage to attack it yet. We’ve always been strong believers in learning by doing, and also in being the guys who ask 1000 questions. Sabin: This book is very much a tell-all-- we spare no details and we don’t pull any punches. We’ve taken the hits and learned the lessons for you, so hopefully, after you read this book you’ll have a leg up on us from where we started.